After yesterday’s long awaited speech by David Cameron on the future of the UK in Europe, Simon Usherwood offers an analysis of its implications. He suggests that the Prime Minister’s speech will intensify, rather than placate, demands from the right-flank of the party. For months, academics, politicians and the blogosphere have discussed both the content and the timing of David Cameron’s intervention on Europe. For a speech with so much hype and trailing, this was always going to be a disappointment and in that respect it did not fail. Even my own delight that an ‘ever closer union’ was discussed is scant consolation. The text itself divides into an analysis of the current situation, some principles for action and implications for the UK. Of these, the first two represent fairly mainstream thinking across national chancelleries, even if they might not care to admit it. It is the third section that is distinctively British. As much as Cameron has been pushed by his backbenchers, who have been the key drivers of EU policy in this Parliament, his more profound instincts as a politician have prevailed. This means keeping options open and working with what is possible. Thus the language throughout the speech is not definitive, or even particularly limiting. Let’s unpack that for a moment. Current government policy (and law) is that new treaties require a referendum. Thus, all that has changed is that Cameron will push for a new treaty and treat the referendum as in/out. But it also requires that he wins the next election, which won’t be fought on the EU issue; as William Hague showed in 2001, wrapping oneself in the flag is all well and good, but it’s a sure-fire vote winner. It also requires Cameron to secure a majority of member states to open an intergovernmental conference, no small feat in itself, especially when even the musings of Angela Merkel on reforms to eurozone institutions have been greeted with groans. Recall that the Constitutional Treaty/Lisbon Treaty process took almost a decade. Taken together, that’s a very incremental step – in keeping with his previous changes in policy – and a big set of hurdles to be overcome. As such, it is not going to satisfy most people, since it looks a bit too much like what it is: a fudge and can-kicking. For sceptics, there will be a natural desire to see this as an opening offer, an admission by Cameron that he can be moved (if slowly). But also for pro-EU elements, the surprisingly positive framing of EU membership might encourage them to become more vocal and to fuel the debate, sensing (or at least hoping) that they can turn the tide, much as happened in 1975. Both these views are optimistic, at best, and delusional, at worse. The entire speech does serve to highlight that the Union is just that, a Union, and that such discussions need to involve others. For instance, what happens if the price of securing Cameron’s concessions is the break-up of the internal market? What happens if the UK votes yes in a referendum, but another country votes no? Neither of these is impossible – indeed, are quite likely – but to pretend that they don’t affect the UK is unhelpful. This should serve to underline that membership is not just about your own country, but about building a Union that serves everyone, which in turn requires some give-and-take. In an ideal world, yesterday’s speech would have closed down discussion, by producing a policy or statement of intent that would have given enough people something to take home. Given that this would never have been possible, then it had to be about a form of words that gave balm to the many: read the first two-thirds and it could have been a fairly bland contribution from a continental foreign minister. But it is the jarring disconnect of the offer to renegotiate that sticks out, the ‘red-meat’. 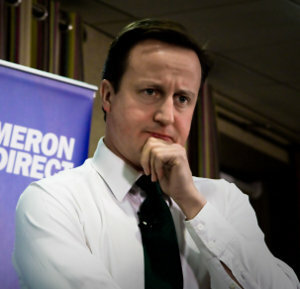 Unfortunately, for Cameron, for too many people, that red meat will turn out to be horse, not beef. With a Labour party that is stepping back from matching his offer, he will find that the pressure to ‘close down UKIP’ and to satisfy his backbenchers will only continue. Expect more speeches. This article first appeared on the British Politics and Policy at LSE blog.